IPD - Aspenhills Consulting, Inc. The construction industry is long-overdue for process improvements that create higher performance and better efficiency. 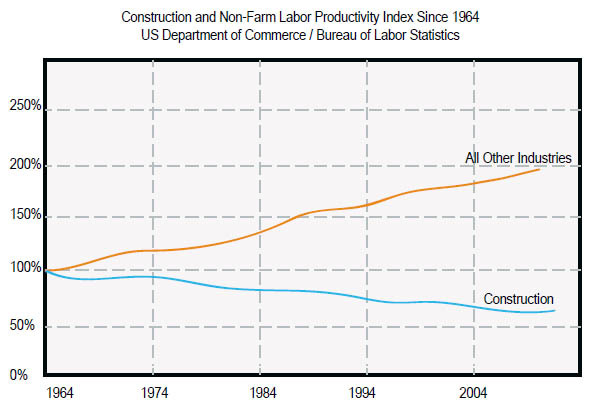 According to the US Bureau of Labor Statistics, the construction industry has actually declined in productivity compared to other industries, including manufacturing. As a result, there is an active movement in the industry towards better processes, practices, and protcols. Among the most promising of these trends is the development of Integrated Project Delivery. IPD brings all the key members of the project together, under one contract. Aspenhills Consulting Inc. acts as an independent resource to assist the project team in implementing IPD. Integrated Project Delivery empowers collaborative, innovative, and efficient teams. When you are asked to be a part of a project incorporating new techniques, Aspenhills Consulting Inc. can assist in the number of ways to make sure your firm or project team is properly prepared to best manage the new environment.